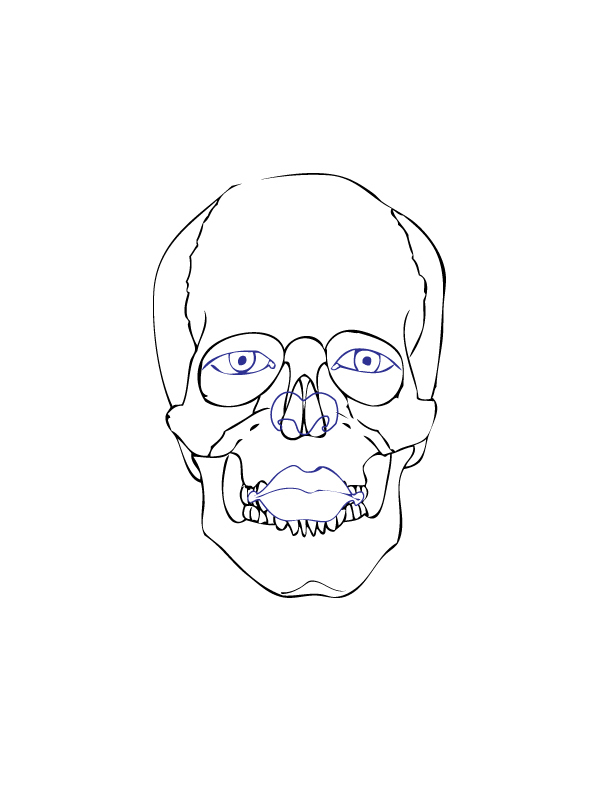 Last Sunday I posted a blog post about the human skull and I figured, that today, I would continue and build on that last post. 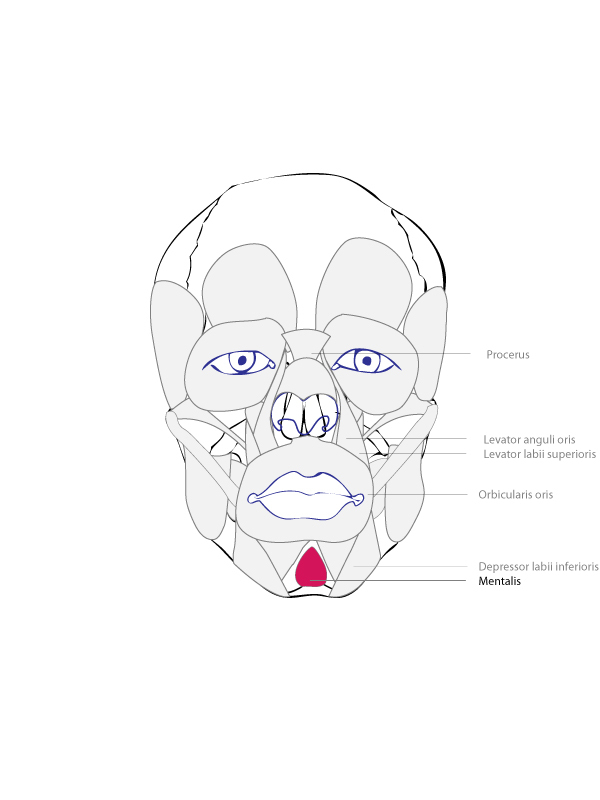 Each muscle has origin and an insertion points. These are the anatomical terms for the different places muscles are attached. 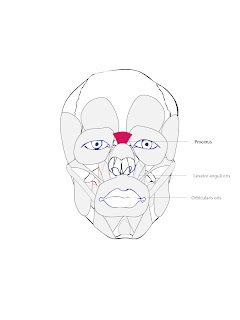 The origin of a muscle is the point or points where the muscle attaches to a fixed location or locations, this is the part of the body is unaffected be the muscle moving. The insertion is the reverse of this attachment, the muscle is attached to the part of the body that is moved by the muscle. For example, the bicep of the arm is attached to bones on the torso, this is origin, and spans across the humerus to the bones forearm, this is the insertion as the arm moves when the muscle contracts. The action of a muscle is the movement that occurs when the muscles contract. For example, the bicep of the arm pulls the forearm up bending at elbow. 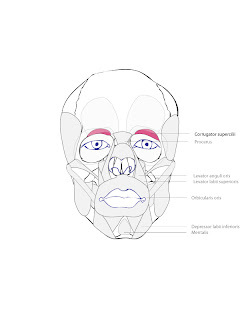 Before we start with any of the muscles, lets place the features on the face. 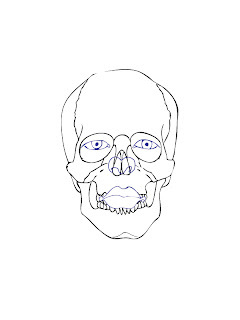 The eyes, nose, and mouth are in the positions as they relate to the skull. Now, we can begin adding muscles. 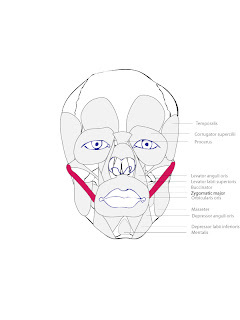 This muscle wraps around the mouth and draws the lips together when the muscle is contracted. A loose analogy is a drawstring on a hood or pouch. The muscle act likes the drawstring, when the string is pulled everything bunches up together. 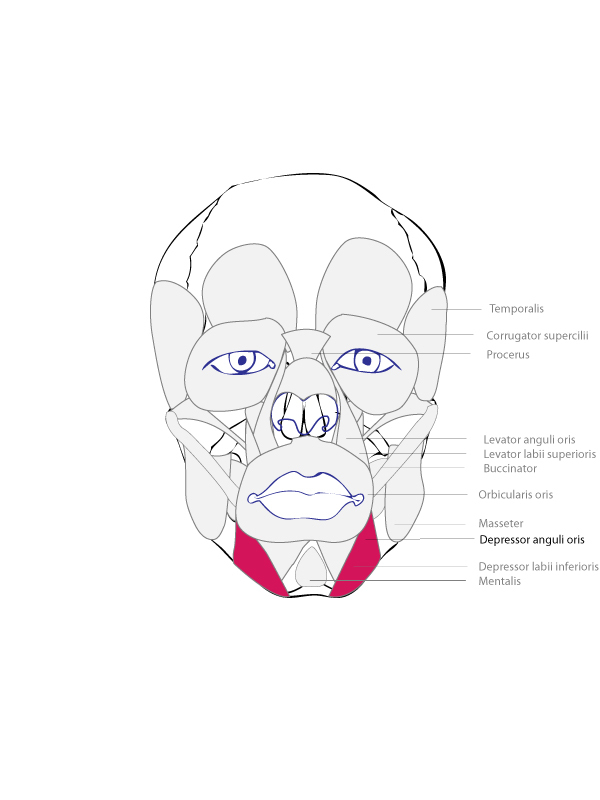 The same occurs with this muscle, when the muscle contracts the lips bunch up or purse together. This muscle is one of the muscles that connects to a bone on one side and muscles on the other. 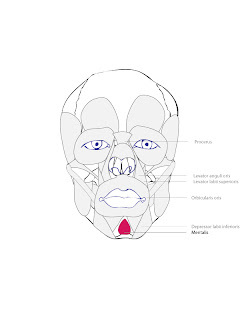 In this case it connects to the muscles of the mouth. 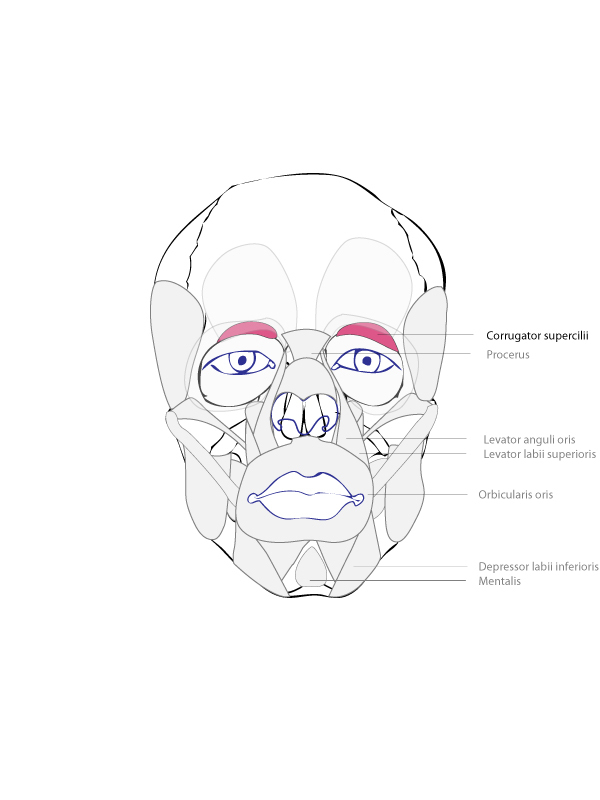 The levator labii superioris raises the upper lip. 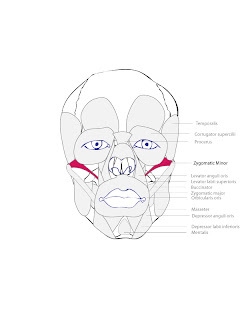 This muscle is part of the brow-line and draws the brow down when the muscle contracts. This muscle contributes to a compression of the brow, which creates the expressive elements of frustration, anger, worry, or an overall menacing look. 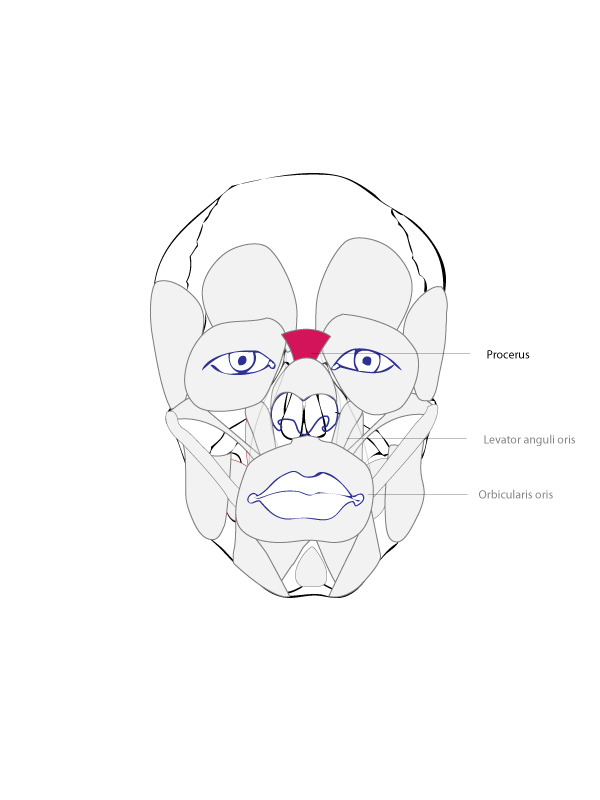 Insertion: the lower part of the forehead. Also called the caninus, this is another muscle connects to the muscles of the mouth and raises the corners of the mouth. 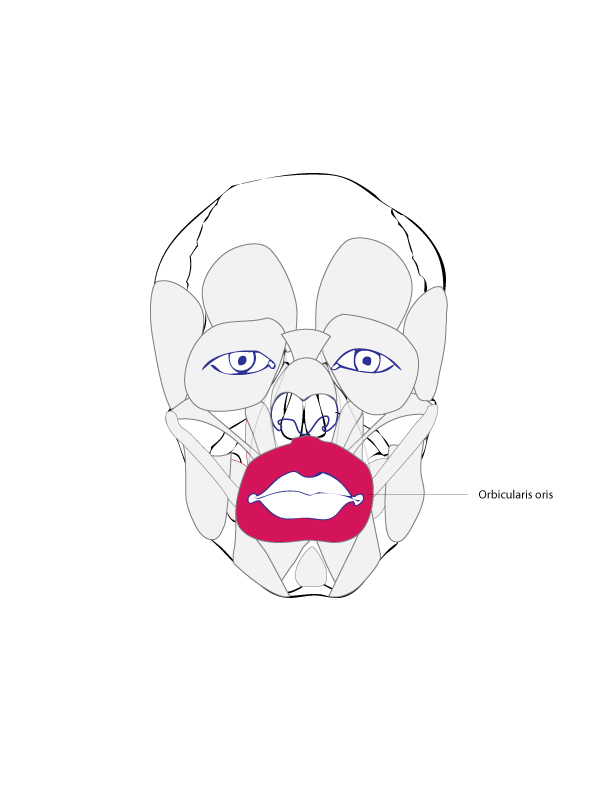 This muscle pulls down the lower lip when contracted, helping with opening the lips of the mouth. 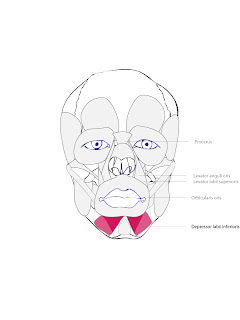 We use this muscle when we lower the whole lower lip to expose the lower teeth. 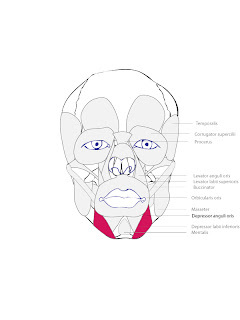 This is the muscle on the chin that is connected to the skin below the lips and the mandible. 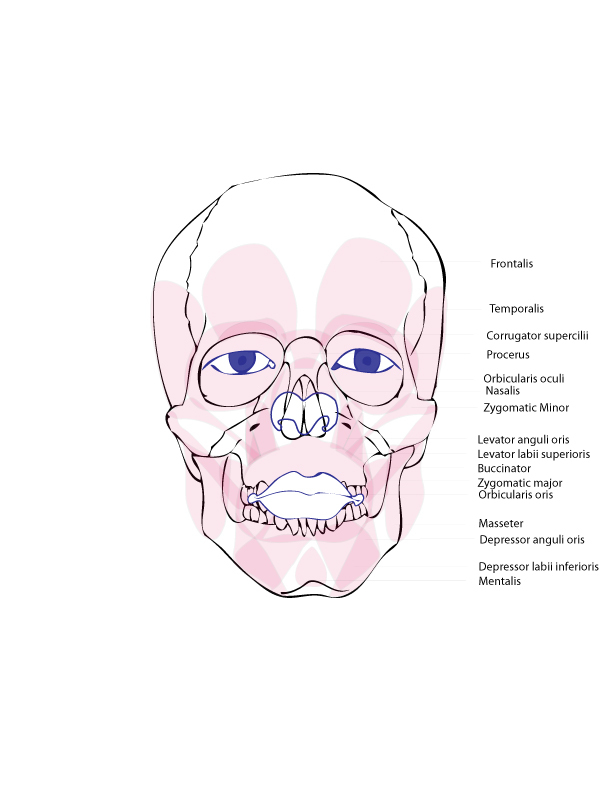 When contracted the mentalis lowers the lower lip. 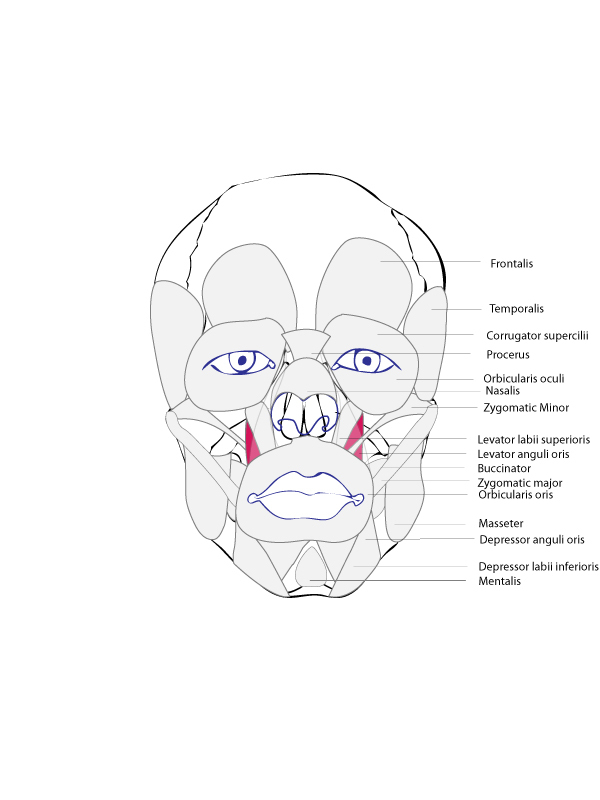 These are small muscles that lay under the larger frontalis muscles. When contracted these muscles wrinkle the brow. Along with the procerus they help with the expressive elements of frustration, anger, and worry. 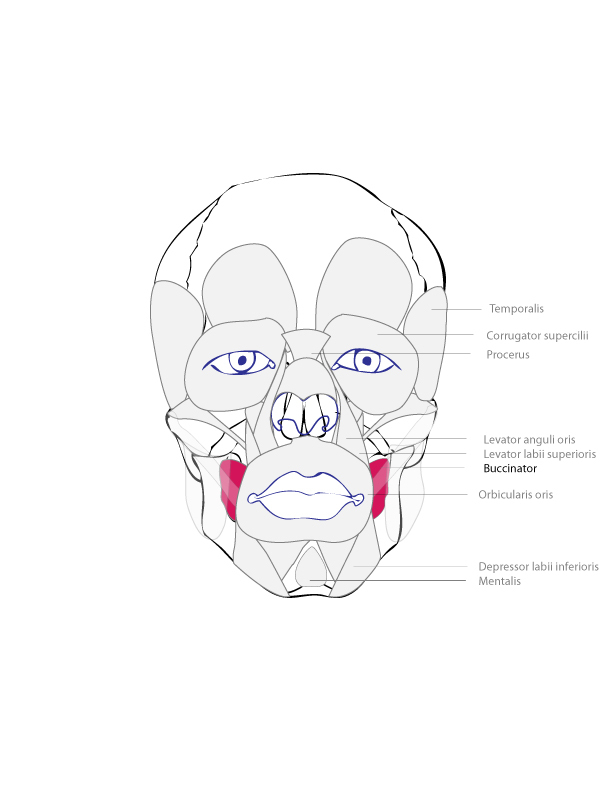 This an important muscle in chewing as it helps raise the jaw when contracted. 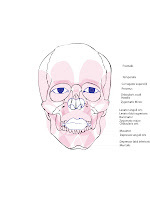 If you put your hand to the side of your head and clench your teeth slightly you will feel the temporalis contract. This is another chewing muscle. 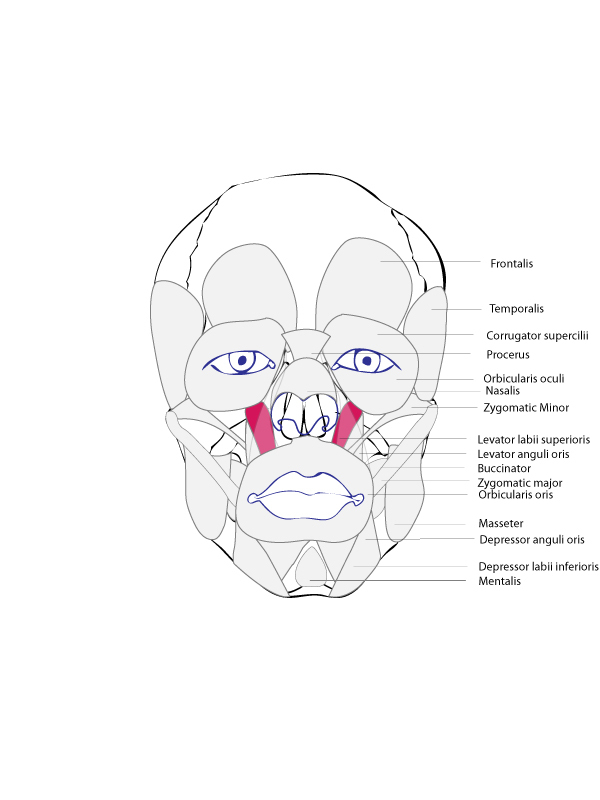 When the muscle contracts the cheeks are pulled in towards the teeth. The buccinator helps keep food where it is supposed to be. One more chewing muscle, this muscle raises the jaw. The masseter plays a large part in chewing. You can see these muscles in action when somebody chews gum or clenches their teeth. 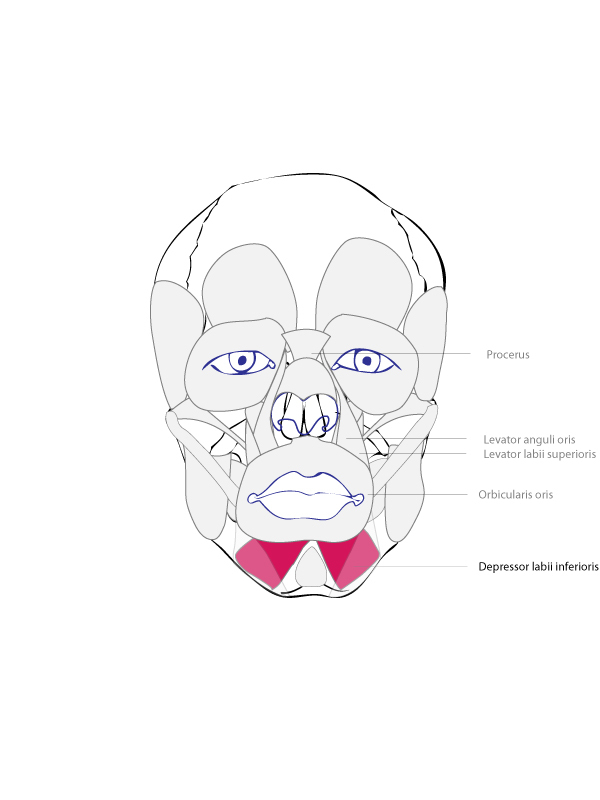 This muscle is attached to the jaw and corners of the mouth. 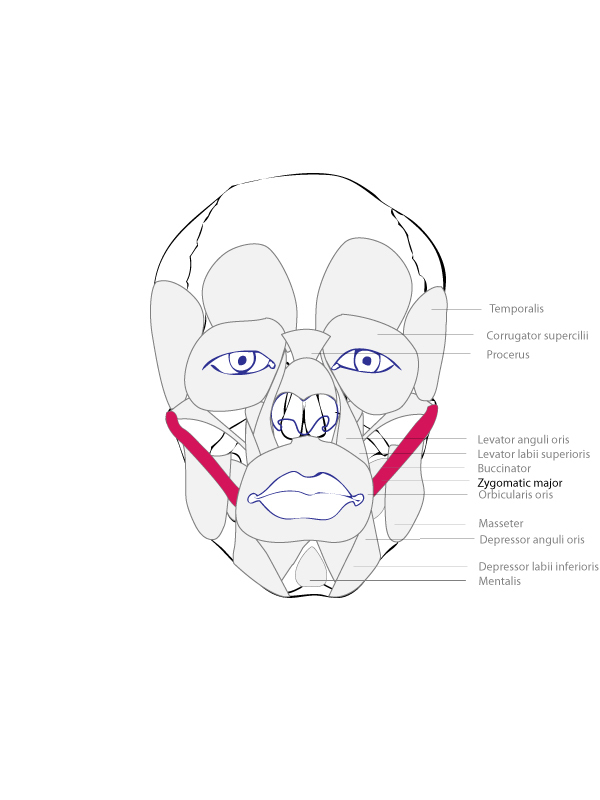 When the muscle contracts it lowers the corners of the mouth, useful for someone wanting to frown or pout. 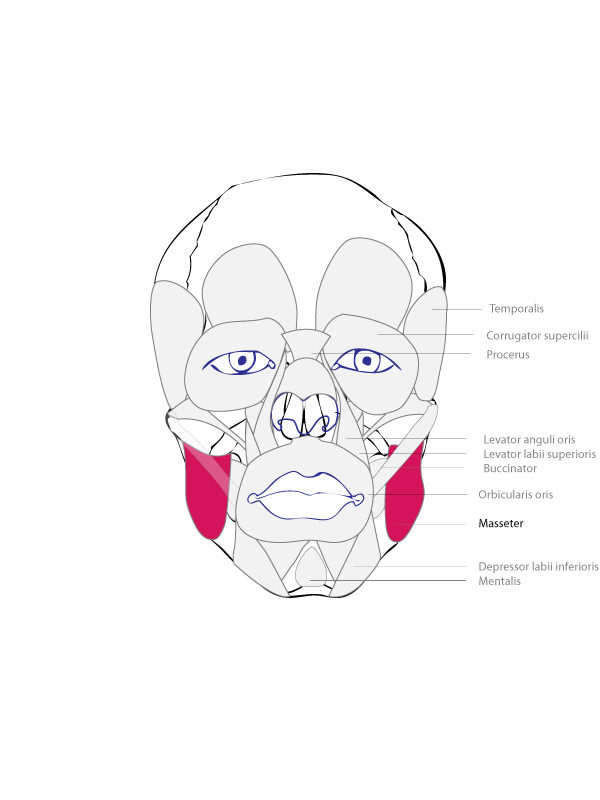 This muscle is attached to the cheekbone and the corners of the mouth. 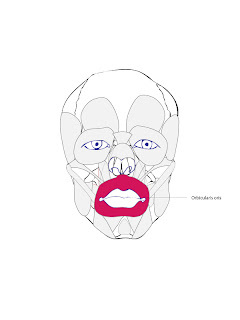 When this muscle contracts the corners of the mouth are pulled up and out. This is another muscle that helps one smile. Action: draws the corners of the mouth up and out. 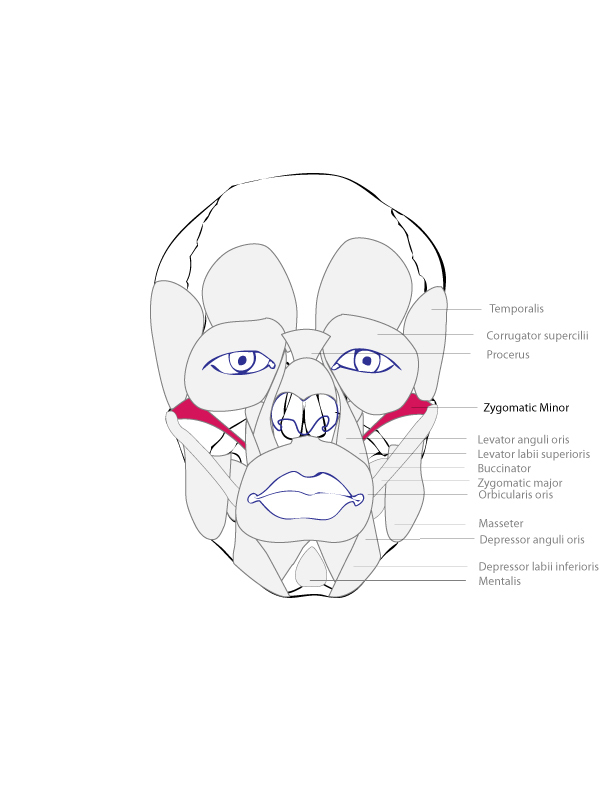 Like many muscles of the face, the zygomaticus minor works in tandem with other muscles to create facial expression. 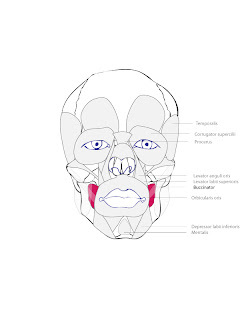 This muscle connects to the zygomatic bone and to the upper lip. 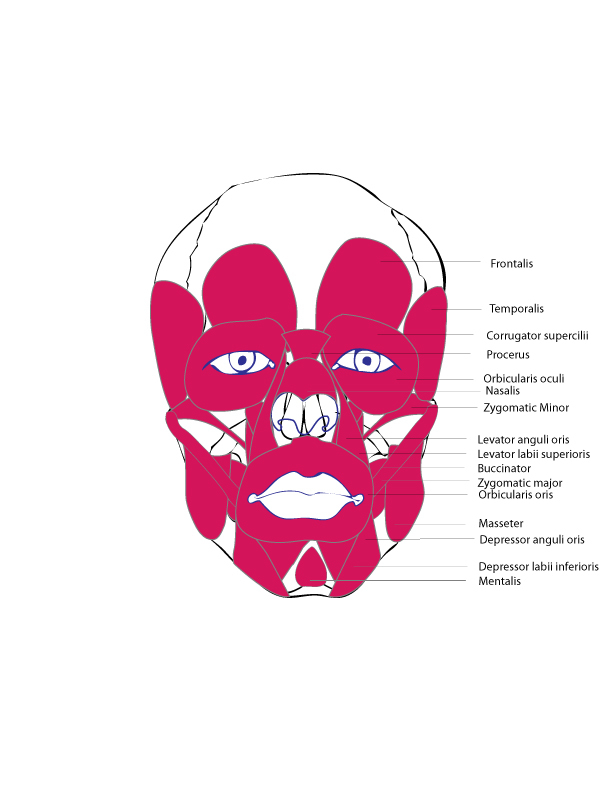 This muscle surrounds the eyes, attaching to the eyelids and the bone around the orbital cavity. 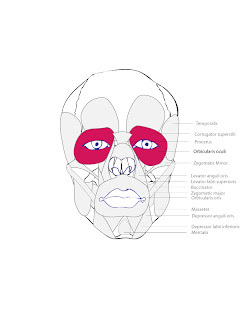 When this muscles contracts the eyelids close. These are the muscles on the forehead. The muscles are connected to the bone on the forehead and skin of the brow. 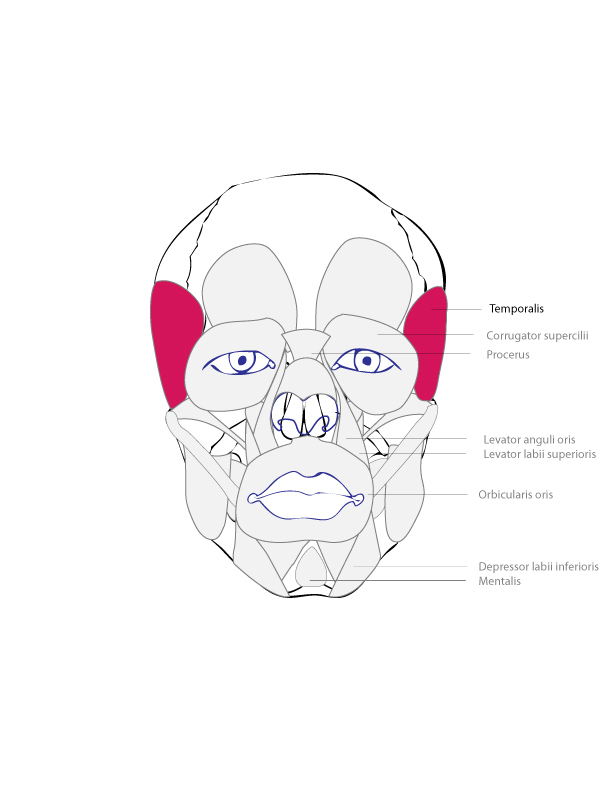 When contracted, the frontalis raises the brow. The raised eyebrows help with the expressions of surprise or alarm. 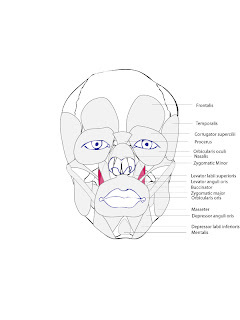 This muscle spans across the nasal bone and connects to the maxilla. 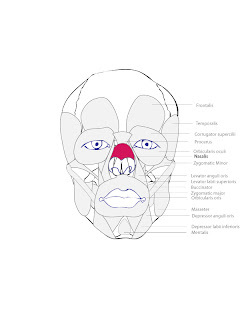 When contracted this muscle moves the nose what limited movement the nose has. 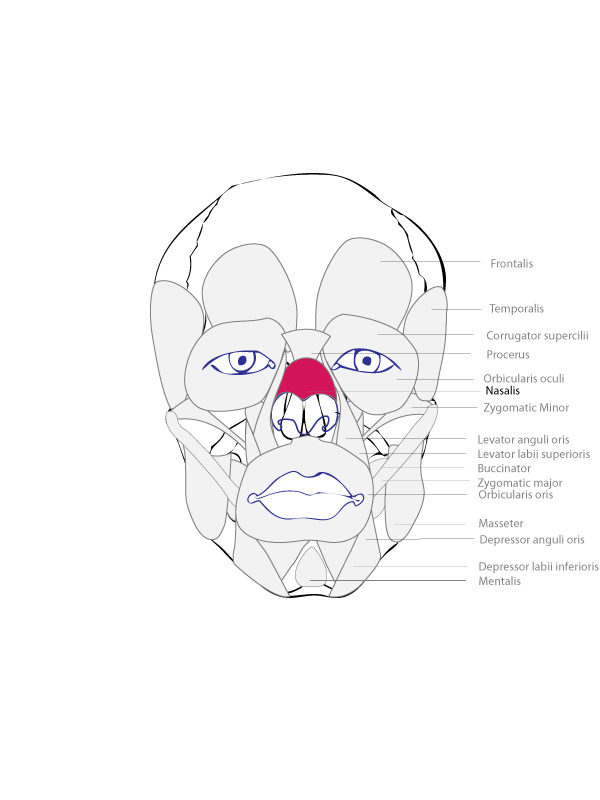 The nasalis will draw together the skin of the nose, useful in an expression of disgust. 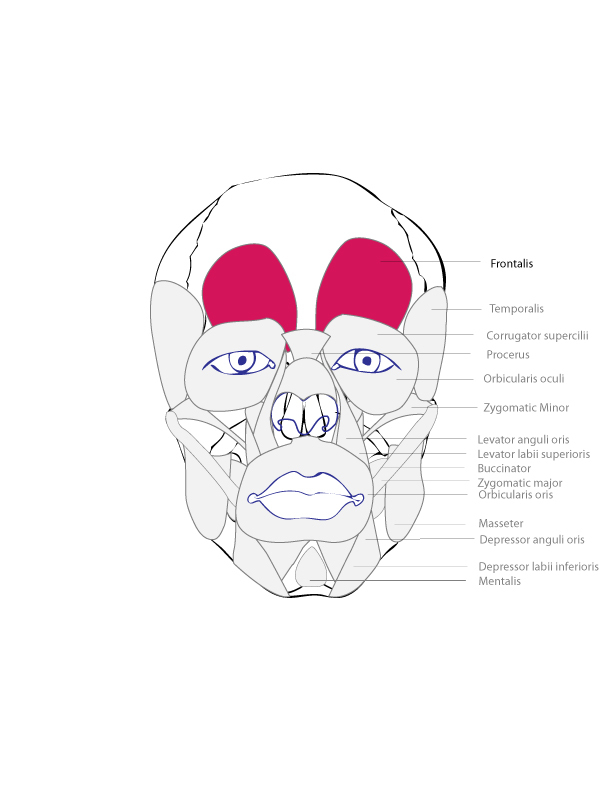 The muscles along with the skull provide the underlying structure and form of the face. The muscles also play an important part in the expressiveness of the face. If we keep this in mind, as we draw at the model, this information will help us find the surface and plane changes of we are looking for easier.